Based in Magnolia, Arkansas, American Fuel Cell & Coated Fabrics Co. (“Amfuel” or the “Company”) manufactures self-sealing, crash resistant aviation fuel cells and liquid logistic tank solutions. As one of two qualified aviation fuel cell manufacturers for U.S. Department of Defense aircraft, Amfuel maintains a significant competitive advantage over its smaller domestic competition. The Company utilizes complex, proprietary tooling and manufacturing processes to produce collapsible, flexible, rubberized fuel storage bladders that are crash resistant and provide ballistic protection qualities for military, commercial and general aviation aircraft (fixed-wing and rotary). In addition, Amfuel manufactures non-aviation, commercial liquid, multi-use storage containers that are designed for large volume and multi-use liquid transport of industrial chemicals, potable water, sewage or ground fuel storage. In 2015, Amfuel embarked upon a strategic initiative to move to a more modern facility in Wichita Falls, Texas. However, the move proved more costly than anticipated resulting in reduced working capital and a negative impact on sales due to the business disruption. After hiring the current CEO in November 2016, management determined the best path forward included abandoning its move to Texas and restoring all manufacturing operations to Magnolia in January 2018. As a result of the move to and from Texas, Amfuel’s operations, liquidity and financial performance were adversely impacted. This precipitated the need for Amfuel to seek a restructuring of its finances and explore strategic alternatives. As Amfuel was unable to restructure its finances outside of bankruptcy, the Company filed for Chapter 11 bankruptcy protection in the Northern District of Texas, Fort Worth Division in November 2017. Amfuel retained SSG as its exclusive investment banker to conduct a comprehensive marketing process to a broad universe of strategic and financial buyers. 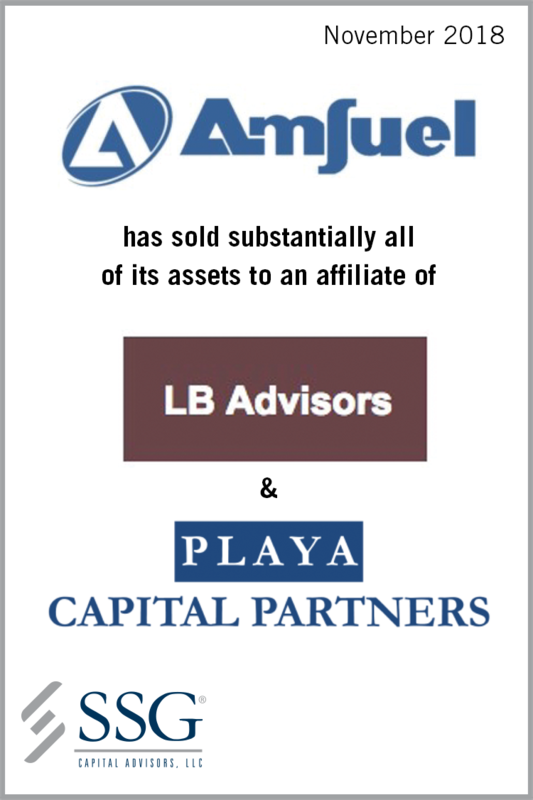 LB Advisors and Playa Capital Partners’ bid was ultimately determined to be the highest and best offer for substantially all of the Company’s assets. SSG’s experience running thorough Chapter 11 sale processes enabled the Company to maximize the value of its assets while preserving the business and employment of over 200 personnel.